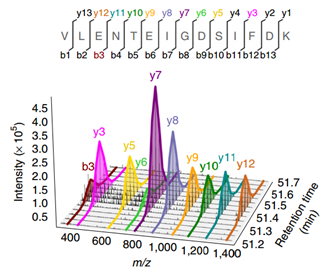 Proteomics is dependent on the collection of tandem mass spectra of peptides and proteins to make identifications in database searches. Large-scale proteome analyses have become more comprehensive as instrument scan speeds have increased and ion dissociation methods have improved. Additionally, protein quantitation has benefited from the creation of internal standards and data collection methods to acquire sufficient data for accurate quantification. However, reliable detection and quantitation of very low abundance proteins and discerning between the abundance and function of distinct proteoforms have remained a challenge. The YRC is developing the technologies below to address these challenges. Extracted product ion chromatograms from DIA data. The analysis of DIA data can be treated in the same manner as targeted acquisition methods like SRM. Building on our work that collected data independent acquisition (DIA) data by measuring multiple precursor isolation windows in a single spectrum, we are developing alternative methods for collecting MS/MS data with improved sensitivity, dynamic range, and selectivity. These improvements result in data from which signal for virtually any peptide can be extracted, evaluated to assess detection confidence, and quantified using SRM-like MS/MS chromatogram extraction. Acquisition is done in a single LC-MS/MS run. The dynamic range of the proteome is daunting. To facilitate measuring low abundance proteins in complex mixtures some groups have developed a hybrid approach where an antibody is used to first enrich the target peptide or protein followed by the detection of the analyte by mass spectrometry. Both anti-protein and anti-peptide antibodies have been used in this type of hybrid method. We are developing technology to greatly optimize this enrichment method. Previously we developed methods for the top down analysis of protein complexes using a combination of capillary electrophoresis and tandem mass spectrometry. A limitation to the analysis of intact proteins is the ability to fragment protein ions for high sequence coverage. We are developing new technology to improve top down analysis in order to interrogate the proteoforms present in protein complexes. Increasingly we need to assign specific proteoforms of proteins to their respective functions and that will require robust and sensitive methods that can detect patterns of modifications and sequence variations.